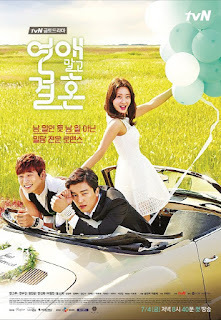 Gong Ki Tae (Yun Woo Jin) is a wealthy, handsome plastic surgeon, who doesn’t believe in marriage. He believes that his life is perfectly planned, and being single is the only option he accept. However, his family is badgering him to marry. But as fate wants it, he meets Joo Jang Mi (Han Groo), while she is proposing to his best friend Lee Hoon Dong (Huh Jung Min). This is where Gong Ki Tae gets a brilliant idea, and wants Joo Jang Mi to act as his fiancée, because he know his family would never accept her as their daughter-in-law and he would never fall for her. His plan would be a success, if not his family were so desperate for him to get married, that they accepted Joo jang Mi, and the wedding preparations started. When I first heard about this drama, I was so happy and thrilled to see Yun Woo Jin as the lead actor, and I hoped this would be his break-out drama, I only remember him from Ojakgyo Brothers, and he didn’t really have a big role there, but it was enough for me to fall for him. The summary of this drama made me even more excited and I looked forward to a hilarious drama. Maybe that’s why I was disappointed, I expected more than what I got. The first 2 episodes were really exciting and amusing, and I couldn’t wait for the lead actors to be a couple. But it ended out as a really dragged out drama, so much that the main chemistry between those two disappeared. I ended up just watching the drama, because I had to finish it. But if you are a big fan of 2AMs Jinwoon, and you need a drama just for fun, then this is a pretty good choice, just don’t make the same mistake as me and expect a whole lot, because you’re not going to get it.